The hardware required for this project are all basic components that you can pick up locally. The schematics are provided below, followed by descriptions of each part. The infrared blaster consists of a IR LED, 37Ω/10KΩ resistor, and a PNP transistor. 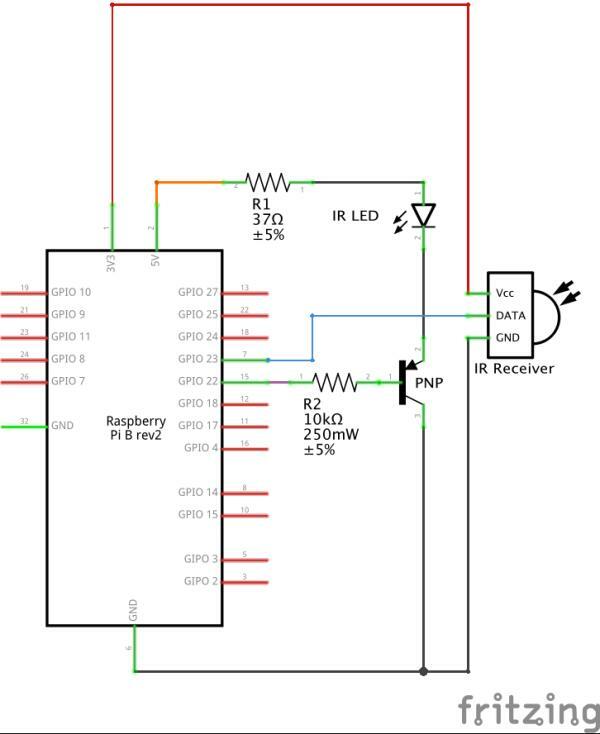 Because the GPIO of the raspberry pi can only handle 50mA maximum, and our LED wants to use 100mA, we will power the IR LED using a PNP transistor and the 5V power supply instead. Connect the IR LED in series from the 5V pin on the Raspberry pi through a 37Ω current limiting resistor to the collector of your PNP transistor (top side in the diagram below, the line in the schematic represents the flat side of the transistor package.) The resistor ensures that the LED will never exceed its 100mA rating. Hook the emitter (bottom) directly to ground. The base of the transistor is what will be used to switch the transistor on and off. Connect it through a 10KΩ resistor to GPIO 22. The infrared receiver is optional, and is only required if you cannot find your remote already in the LIRC Remote Database. The receiver is connected to ground and 3v3 from GND and Vcc respectively. 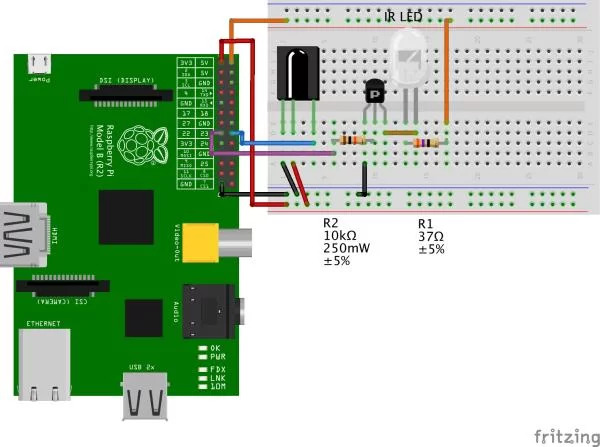 The Data pin on the receiver should be connected to GPIO 23. Because the GPIO varies slightly between raspberry pi models, please check out this GPIO reference guide to find exactly which pin to connect to. LIRC stands for Linux Infrared Remote Control. The acronym speaks for itself, really. With almost no work, this package allows you to record and play back from any infrared remote control. Next, we have to fix the configuration of lirc for your pi. Modify /etc/lirc/hardware.conf to match alexba’s below using your nano /etc/lirc/hardware.conf or your favorite text editor. Next, run these commands to finish setting up the pi and restart LIRC.